CakeBoxx Technologies and transport and logistics leader Anderson Trucking Service (ATS) just introduced a new product for the US domestic cargo market. The 53’ WTP configured hybrid container is designed to provide a container-based alternative for the shipment of breakbulk freight. The new product was aptly named the ‘Breakbulk Box’ by Steve Hastings, ATS Director of Operations at the ATS International facility in Jacksonville, Florida. The Breakbulk Box uses CakeBoxx’s trademark ‘deck and lid’ form factor to take advantage of the best attributes of a flatbed trailer, flat rack and fully enclosed intermodal shipping container to moving seamlessly between truck, rail and ship. It’s expansive 53’ length allows breakbulk and oversized cargo to be loaded directly onto the container deck and is secured in place using a fully customized Perimeter Tie Down System (PTS)™. The WTP configuration of the new CakeBoxx product is tailored to US intermodal transport handling equipment. 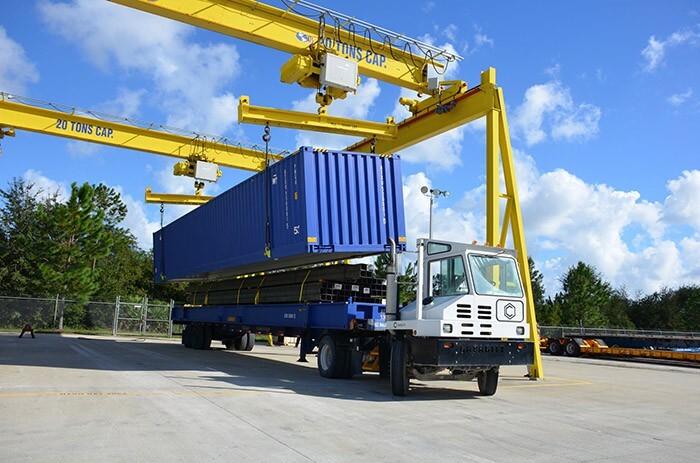 The Breakbulk Box container is handled in the same way as any other shipping container or CakeBoxx product, with a lid removable by cranes, reach stackers and other equipment commonly used in intermodal freight handling. “We anticipate this being a game changer for the entire breakbulk cargo industry…”. ATS launched the prototype at JAXPORT in late October and sent it on its maiden voyage in early November.